High doses of B vitamins did not slow thinking and memory declines in people with Alzheimer’s disease, according to a rigorous new report. The study, which looked at the B vitamins B6, B12 and folic acid in people with early to mid-stage Alzheimer’s, appeared in the Journal of the American Medical Association. B vitamins are often touted as a way to prevent heart disease and strokes. They may also benefit people at risk for Alzheimer’s, other studies suggest, because what’s good for the heart is good for the brain. People who smoke, for example, are at increased risk for heart attacks and strokes — and also at increased risk for Alzheimer’s. Diabetes, likewise, dramatically increases the risk of heart problems and also increases the risk for Alzheimer’s. Other studies have suggested that various B vitamins could reduce the risk of Alzheimer’s or slow its progression. Vitamins B6, B12 and folic, taken together, can dramatically lower levels of an amino acid called homocysteine. High levels of homocysteine in the blood have been linked to heart attacks and strokes and are thought to damage blood vessels, including those that nourish the brain. People with Alzheimer’s, studies show, often have high levels of homocysteine. One large study in more than 1,000 seniors found that high levels of the amino acid were associated with a two-fold increased risk of Alzheimer’s disease. Homocysteine, in excess, can damage the heart and blood vessels, including the blood vessels that nourish the brain. And research in animals suggests that high levels of homocysteine and low levels of folic acid may make brain cells more vulnerable to damage from beta-amyloid, a toxic protein that is linked to Alzheimer’s. Finally, homocysteine itself may be directly toxic to brain cells, experiments suggest. Researchers at the University of California, San Diego, undertook the current study to determine whether vitamins B6, B12 and folic acid, taken together, can help people with Alzheimer’s by reducing levels of homocysteine. They enlisted 409 men and women in the early to middle stages of Alzheimer’s disease, who were randomly divided into two groups. Some were given high doses of the B vitamins, in daily doses of 5 mg of folate, 25 mg of vitamin B6, and 1 mg of vitamin B12. The remaining patients were given lookalike placebo pills. The study lasted 18 months. After this time, the researchers tested patients’ thinking and memory skills using a standard Alzheimer’s test. They found that even though the vitamin supplement regimen reduced homocysteine levels by almost a third, it had no benefits in slowing cognitive decline. In an editorial accompanying the study, doctors at Oxford University in England noted that it was unclear why B vitamins did not have benefits for the brain, despite lowering homocysteine levels. It may be that people with Alzheimer’s disease are already far advanced in the course of their illness, and that vitamins will do little to reverse the damage that’s been done. B vitamins, which have no known harmful effects, are found in a variety of foods. Cereals and breads are also routinely fortified by folic acid. Your best bet may be to follow a heart-healthy diet low in fats and rich in fruits and vegetables and whole grains to help maintain the brain and preserve the memory. A sound diet helps to maintain the health of the blood vessels, including those that supply oxygen and nutrients to the brain. In addition, regular exercise and mental and social stimulation is thought to be critical to keeping the mind active and alert into old age. 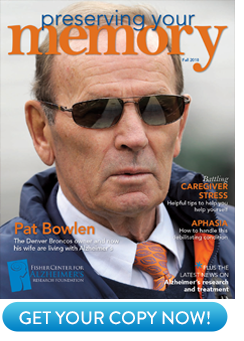 For more on Alzheimer’s and preserving the memory, visit www.ALZinfo.org, for news, updates, and background health reports. Paul S. Aisen; Lon S. Schneider; Mary Sano; et. al., for the Alzheimer Disease Cooperative Study: “High-Dose B Vitamin Supplementation and Cognitive Decline in Alzheimer Disease: A Randomized Controlled Trial.” Journal of the American Medical Association, Volume 300 (Number 15), October 14, 2008, pages 1774-1783. Robert J. Clarke; Derrick A. Bennett: “B Vitamins for Prevention of Cognitive Decline: Insufficient Evidence to Justify Treatment (editorial).” Journal of the American Medical Association, Volume 300 (Number 15), pages 1819-1821.